The GEIGER Gravure Proofing Press Model SGP 1540 is the standard of the industry for more than thirty years, used in the laboratories of most of the leading manufacturers of inks and papers throughout North America, South America and Europe.Cost-conscious production printing houses find the GEIGER Proofing Press profitable in reducing down-time on their large press by first making a test reproduction of the inks to be used on the specific type of stock before going into production. 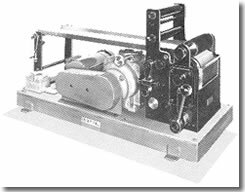 Standard Gravure Press print cylinder: 1.5" dia. x 4.5" wide. Printing speed: up to 120 ft./min., fixed or variable speed. Motor drives: available to meet prevailing or special needs; standard or explosion-proof; 120 or 240 V., 50 or 60Hz. Air drives also available (refer to Model AGP-154O below). Similar in design to the Model SGP shown above, the GEIGER air-driven variable speed gravure press is specifically designed for hazardous locations. Air consumption: 25 cu.ft.Imin. at maximum speed (0.6 HP). Press dimensions: 12" wide x 16" long x 16" high. Total weight is only 56 pounds which makes the unit easy to relocate or store when not in use. Specifically designed to print roll stock or rigid board up to 60 point. Two locations for the doctor blade are provided; one positioned high and close to the nip for roll stock, and a lower position to allow the board to pass through without bending. 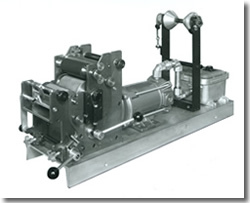 As shown; set-up with sheet guide and explosion proof motor with a variable speed mechanical transmission drive. Special size presses are also available with 4" diameter printing cylinder for web widths up to 14 inches wide.